Using industry-standard SQL Server technology, an advertising-supported website can manage clients' messages in powerful, versatile ways. This is an excellent fit for a publication that needs -- or chooses -- to give print advertisers full-scale display online. The administrative control panels make it easy to keep track of hundreds of advertising accounts. This system can be customized to meet a business's unique requirements. Ad display is managed through an easy-to-use control panel that runs in off-the-shelf Microsoft Access software. MS-Access is part of professional versions of the Microsoft Office suite, and features user-friendly forms for managing data. to example. This is a screen capture of a form in MS-Access. An optional online control, which runs in any web browser or mobile device, allows authorized administrators to manage ads from anywhere. This permits a sales person in the field to instantly create and activate a new client's online listing. Administrative features include expiration dates, sales status, payment status, invoice numbers and sales person's name. Notes and history features allow users to confidentially record and share important information about a client. A typical online ad display features index pages showing an array of thumbnail graphics, intuitively linked to individual advertiser pages that display ads at full size. These listings include one-click access to the client's website, email "contact this vendor" form, locator maps and other information for customers to use. Clients' advertisements can be sorted by business category, and arranged in order of size, price or any other criteria. Locator maps help customers find advertisers' business locations at a glance. We can link to Google Maps, or create a customized locator feature controlled with simple X/Y coordinates. We'll draw original base maps if needed, or can use existing map graphics. The system accommodates multiple base maps, making it suitable for sites serving a wide geographic area. Contact forms let prospective customers send emails directly to your advertisers, with a reminder to your clients that these business inquiries came from your web site. A unique "Suspension" feature permits one-click disabling of a delinquent client's listing. A customized message for customers explains in your preferred wording that the merchant's listing is temporarily unavailable -- a powerful incentive for advertisers to bring their accounts up to date. This system is available for websites hosted on Microsoft IIS servers. Data is stored in a robust, scalable MS-SQL Server database on the web server. That "back end" database is securely linked to the "front end" interface, using the Access component of MS Office. The front end administrative form gives your managers instantaneous one-click control over each advertiser's online listings. Unlike one-size-fits-all solutions, this proven system is totally customizable to meet your specific needs. It can accommodate multiple titles, geographically zoned editions, trade show exhibitors, and an infinity of other situations. Tell us what you need; chances are we can make it happen, quickly and economically. to client-directed online coupon system. Click graphic for a live example of our ad display system. 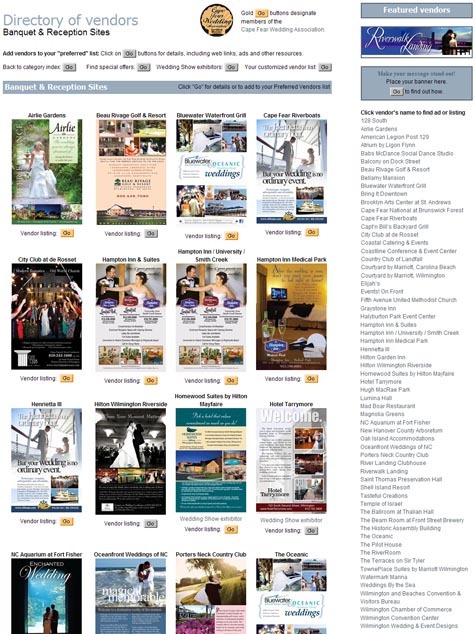 This is an example of how thumbnail versions of display advertisements are arranged in a directory of vendors, sorted by business category and alphabetized. This system includes the option to give preference to larger ads, arranging display by ad size. Users can still quickly find any vendor with the alphabetical listing on the right. Click to explore the actual live directory and test its features and options.